Looks like a Mild Winter! According to the legend of the woolly bear caterpillar, the wider that middle brown (rust-colored) section is (ie. the more brown segments there are) the milder the coming winter will be. If you see more dark, the winter will be harsh. Woolly bears are one of the few caterpillars people can identify by name. 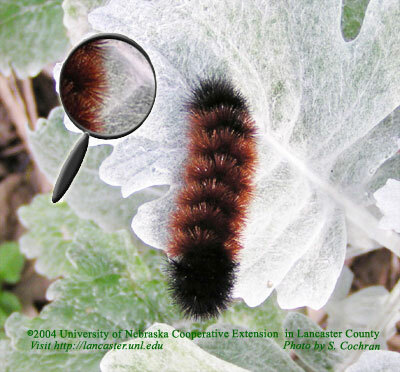 Sunny, fall days are terrific times to look for the caterpillars since they are moving to look for overwintering sites. Did you know woolly bears survive in the Arctic? These are amazing animals! Once the caterpillar has found a protected site and the temperatures drop, it creates a natural organic antifreeze. They freeze bit by bit, until everything but the interior of their cells are frozen. These caterpillars can survive in temperatures as low as -90 degrees F. The woolly bear caterpillar has even been known to survive an entire winter completely frozen in an ice cube. When spring arrives, woolly bears spin fuzzy cocoons and transform into a moth - Isabella Tiger Moth (Photos). If you find a woolly bear caterpillar scurrying across your path, enjoy it for a moment. For fun, examine the bands on the caterpillar and see if you can make a prediction for the upcoming winter. Then, gently release the caterpillar near leaves and other debris so it can find shelter. (Note: The stiff hairs on these caterpillars may be irritating if you have very sensitive skin. If you want to examine the caterpillar closer, gently move it to a leaf or stick where you can handle it without worrying about touching it).